Angel Tree Topper. Clear Bulbs. Size: 10 inches. Holiday Lighted Tree Toppers, Lit Stars and Angels by by Kurt S. Adler, Inc. creators of renowned Christmas Decorations and Holiday Decor. Christmas Glass Final Tree Topper w/Santa. Size: 16 inches. Christmas Tree Toppers Decorations and Santa Themed Holiday Decor by Kurt S. Adler. Size: 16.5 inches. Christmas Tree Topper Glittered w Peacock Patterns 10pt Star Topper. Christmas Ornaments Decorations and Peacock Themed Holiday Decor by Kurt S. Adler. Shatterproof Tree Topper. Size: 8 inches. Christmas Ornaments and Decor by Kurt S. Adler featuring Shatterproof Ornaments. Gold acrylic star of Bethlahem tree topper. Size: 5.5 inches. Christmas Flowers, Floral Sprays, Floral Picks, Garlands and creations by Kurt S. Adler. Polar Star Tree Topper. 12V 0.72W Clear incandescent Bulbs. Size: 11 inches. Indoor Use Only. Christmas Lighted Tree Toppers, Lit Stars by Kurt S. Adler, Inc. creators of renowned Christmas Decorations and Holiday Decor. Size: 14 inches. Christmas Star Tree Toppers Decorations and Star Themed Holiday Decor by Kurt S. Adler. Polar Star Tree Topper. 12V 0.72W Multi Colored incandescent Bulbs. Size: 11 inches. Indoor Use Only. Christmas Lighted Tree Toppers, Lit Stars by Kurt S. Adler, Inc. creators of renowned Christmas Decorations and Holiday Decor. Size: 10 inches. 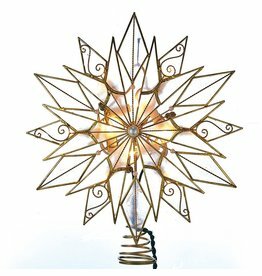 5 point capiz star with wire rays and acrylic beads accent lighted tree topper with brass plated finish, 4 spare bulbs and 2 replacement fuses - indoor use only. Christmas Ornaments Decorations and Themed Holiday Decor by Kurt S. Adler. Size: 4 inches. 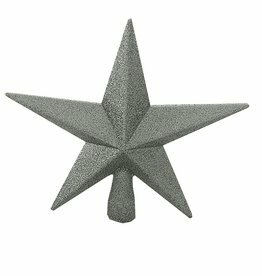 MIni Glittered Star Shatterproof Tree Topper with coil at the bottom for attaching to tree. MIni Christmas Ornaments and Decor by Kurt S. Adler Petite Treasures collection featuring Mini Tree Decorations, Trimmings and Mini Tree Toppers. 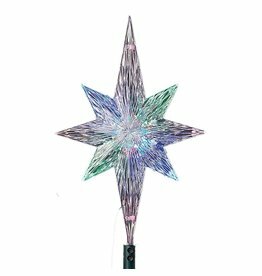 Christmas Color Changing LED Star Tree Topper with 60 inch green lead wire and adapter-indoor or outdoor. Size: 8.5 inches. Christmas Star Tree Toppers and Holiday Decor by Kurt S. Adler. 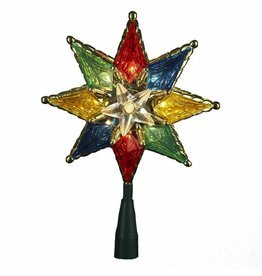 Multi Color 8pt Christmas Star Tree Topper with 30 inch green lead wire. Use: Indoors. Size: 8 inches. Christmas Star Tree Toppers and Holiday Decor by Kurt S. Adler.